This year’s market featured a greater diversity of goods than ever; from nail art to tea paraphernalia, pyrographic creations to cosmetics as well as an array of Christmas decorations, cards, jewellery and cakes. Amongst the 80 or so stalls were student societies including the Bangor University Octopush Club, the Tea Time Society, The Marine Mammal Society, Enactus Bangor, who were selling their Calendar of local photographs in collaboration with the Photographic Society in order to fund community projects and the Makerspace Society, a society of creators, makers and programmers. A group of learners who are completing the independent living skills course in the Llangefni site of Grŵp Llandrillo Menai had success selling Christmas gifts and wreaths. Various international student societies were active as well selling African fabrics, costumes and snacks, middle-eastern crafts, Japanese origami cards and Vietnamese foods and crafts. 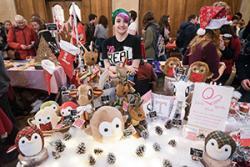 Rhiannon Quirk: Photo: Tim Pockney PhotographyBangor Product Design graduate, Rhiannon Quirk, who’s recently started her own business, Quirks Plushies, created a buzz amongst the customers with her beautiful handmade soft toys. Rhiannon said: "My stall was a success, at times I was rushed off my feet. The experience has given me a better idea of pricing, interacting with customers, and which of my products were most popular with customers. The overall experience has been very beneficial to me, and I would recommend it to anyone who wants to start a business." 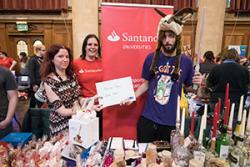 The Best Overall Stand prize, sponsored by Santander Universities, was awarded jointly to Grace Lawson and Jonah Hayward. Several of the stallholders attended workshops on ‘How to Price’ and ‘How to Engage with Customers’ beforehand and one to one business mentoring sessions were offered as part of the B-Enterprising provision. 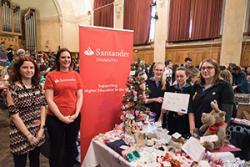 Some of the student traders continued to trade over the weekend at the Bangor Christmas Cracker which was held at Bangor city centre. 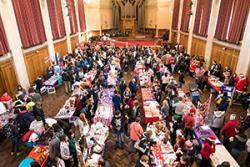 The Student Christmas Market is coordinated annually by B-Enterprising at the Careers & Employability Service. B-Enterprising is part funded by the Welsh Government to support the delivery of the Youth Entrepreneurship Strategy (YES) for Wales.